The citizen’s dialogue captioned Community intervention for SDG Delivery: Listening to the Grassroots Voices was held by The Citizen’s Platform for SDGs, Bangladesh and The Hunger Project on Saturday 20 May 2017 at the CSS Ava Centre, Khulna to tap the grassroots voice regarding SDG delivery in Bangladesh. The dialogue was widely attended by academics, economists, social workers, business leaders, politicians and other professionals from the Khulna Division. Md. Moniruzzaman Moni, Mayor, Khulna City Corporation and Md Abdus Samad, Divisional Commissioner, Khulna were present as the Special Guests for the event. DrMustaque Raza Chowdhury, Core Group Member, SDG Platform and Vice-Chairperson, BRAC shared his views as on the theme of the dialogue which was chaired by Dr. Debapriya Bhattacharya, Convenor, Citizen’s Platform for SDGs, Bangladesh and Distinguished Fellow, Centre for Policy Dialogue (CPD). Dr. Baidul Alam Majumdar, Country Director, The Hunger Project, in his presentation, highlighted different awareness’s of the 2030 Agenda focusing on Goal 16 dealing with rule of law and institutions, human rights and good governance. He also emphasized the need to engage Government officials, local government representatives, and conscious citizens in a development partnership. He also elaborated some successful field level models in this regard. A wide ranging stakeholders participating in the discussion, provided local level experiences regarding challenges faced by elected members of the Union council, Upazila and City Corporations in discharging their duties. They recommended amendments of relevant legislations, reforms of mandates and duties and their improvement of financial management related capacity. They also underscore the need to elect honest and competent people to the local government bodies. The participants drew attention of the policy makers to develop Khulna and the coastal region taking note of its vulnerable ecosystem. The Divisional Commissioner informed the house about various innovations that the government is pursuing in the area of public administration and governance. 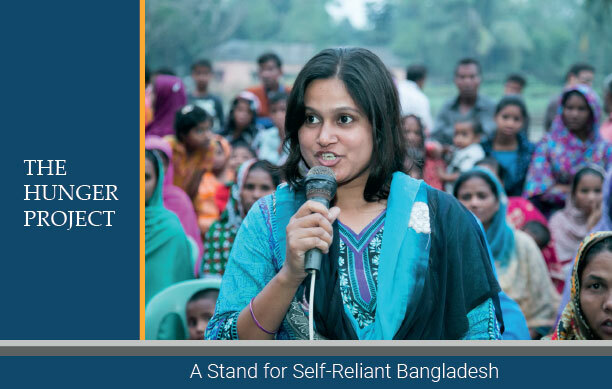 As an example he cited, the initiative to make Khulna free of beggars and provide them with livelihood opportunities. The Mayo, Md. Moniruzzaman Moni, explained the need to effectively mobilize and neutralize local level resources and the need to have greater coordination among the City Corporation and other agencies of public utilities. The mayor referring to the problem of water logging and bad state of city roads he urged for better coordination between city corporation and Khulna WASA, he also mention the need for better governance in the overall government machinery, so that the local government representatives may perform more efficiently and honestly. 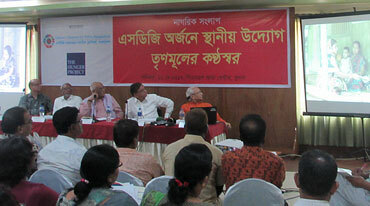 Dr Mustaque Raza Chowdhury, pointed out that achieving SDG will be more challenging than attaining MDGs in Bangladesh. He said notwithstanding our high success in MDGs, Bangladesh remains behind the achievements in comparable countries. He said for example, maternal mortality rate in Bangladesh is still twice high than that of in Sri Lanka. In his concluding remarks Dr. Debapriya Bhattacharya emphasized the need for having an effective country-wide local government platform so that the voices of the local and grassroots leaders can resonate in the corridors of power in Dhaka. He reckoned that a strong social movement by the citizens will make that happen in the interest of implementing SDGs in Bangladesh.